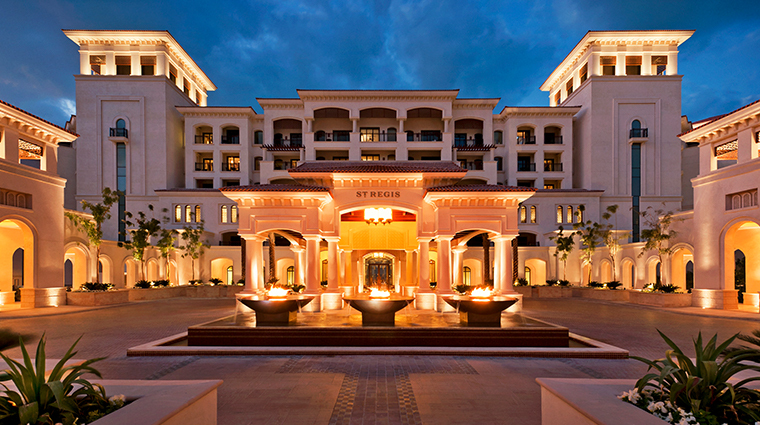 If bright sun, lush tropical gardens and white sandy beaches that fade into nothing but miles of azure water and cobalt-blue skies sound like an idyllic getaway, then The St. Regis Saadiyat Island Resort, Abu Dhabi should be on your bucket list. 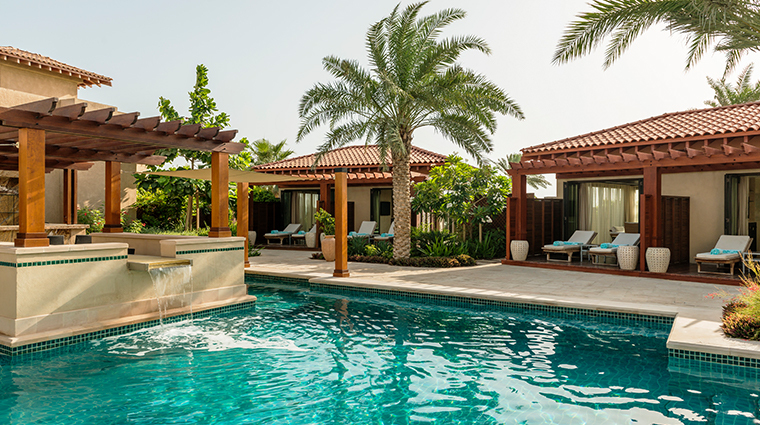 This Mediterranean-inspired resort is moments from Abu Dhabi International Airport but feels miles away from any metropolis. The exclusive hotel’s proximity to the city and sophisticated atmosphere make it a compelling choice for business travelers, while its seclusion and island vibe cajole holiday-makers and families. 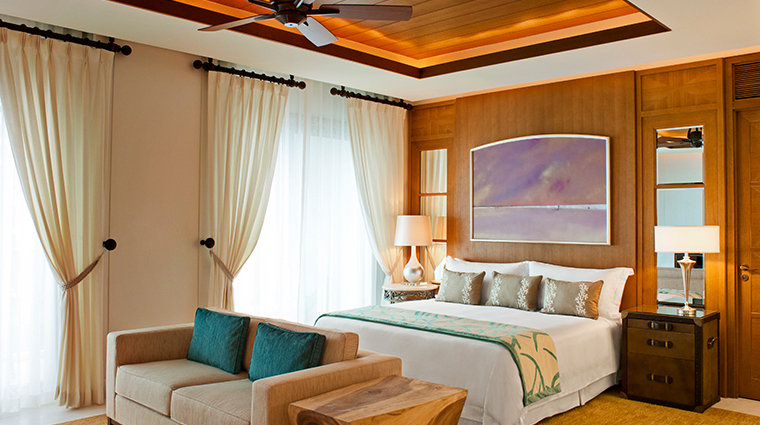 Opportunities to indulge lie around every corner: each room is equipped with bespoke butler services, Iridium Spa takes pampering to impressive new dimensions with its personalized treatments and beachsidecabanas, and six dining outlets provide endless flavor combinations as well as a legendary Friday brunch. 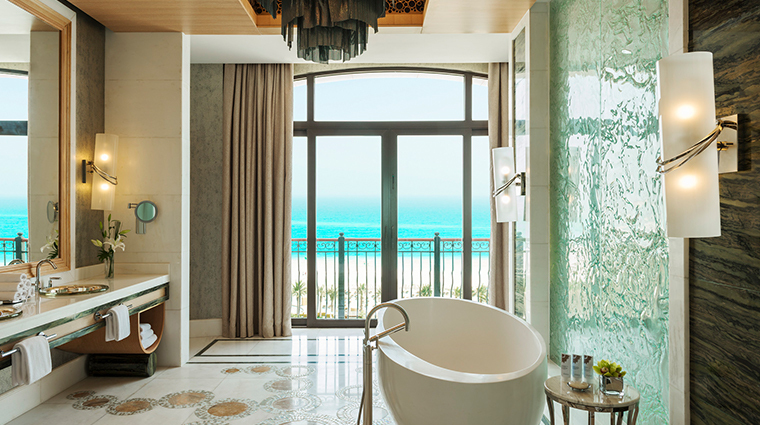 Superbly positioned with glorious views of the sea and six-mile Saadiyat beach, this vast Abu Dhabi hotel is a short 15-minute drive to the city center. 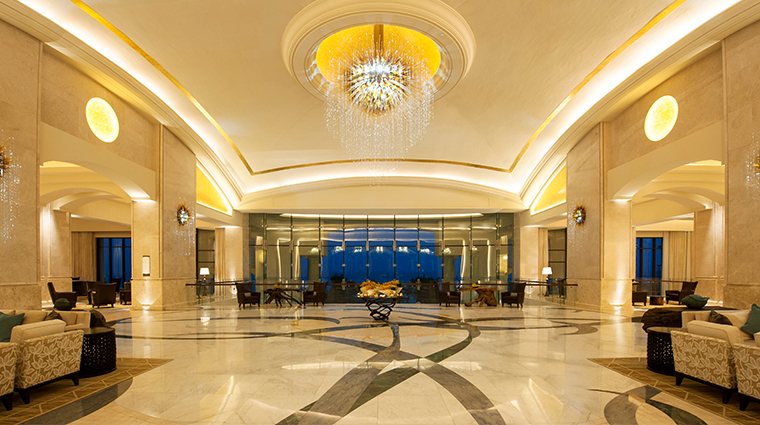 Every accommodation, from standard rooms to The Royal Suite, has a butler who is dedicated to fulfilling and anticipating your every need at breakneck speed. 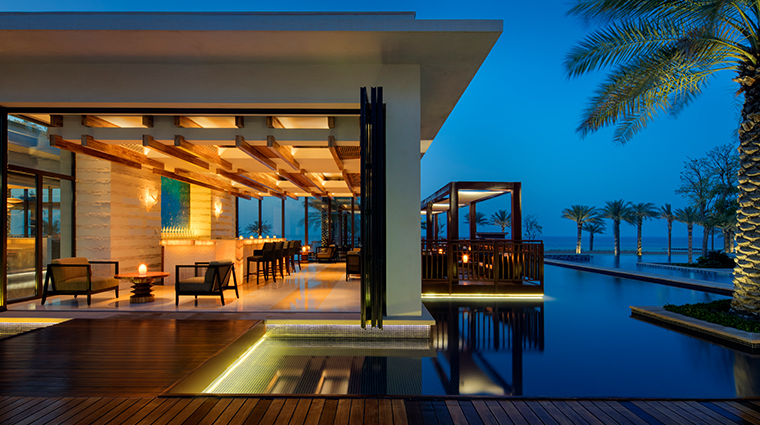 The resort is home to the world’s first permanent Buddha Bar Beach lounge, a day-to-night destination for locals and visitors alike with its chic décor, delightful selection of Pacific Rim cuisine and bohemian-beachside vibe. 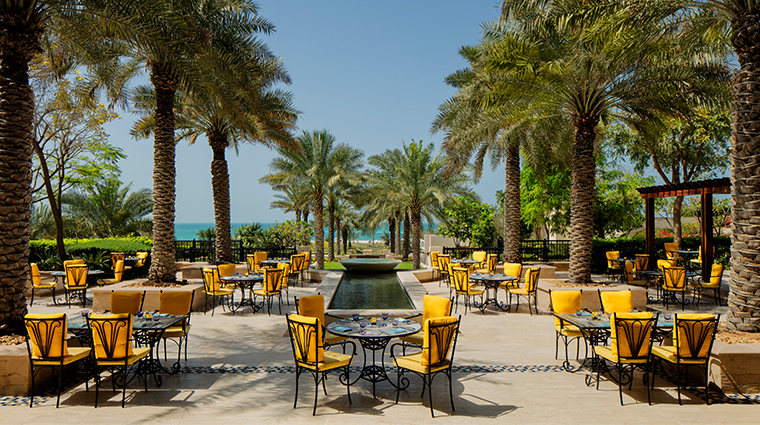 Brunches are an integral part of Abu Dhabi life, and the St. Regis’ Friday spread is a lauded one. Diners may find themselves in a perennial battle of will trying not to sample all of the 25-plus cheese and wine pairings or every delicacy in the brunch’s massive mini-dessert lineup. 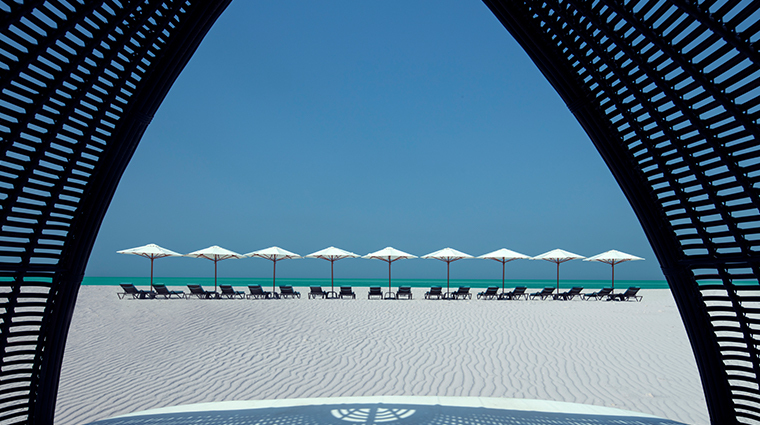 “Time dedicated to you” is the mantra of The St. Regis Saadiyat’s Iridium Spa, a posh paradise among the bustle of the beachfront hotel. 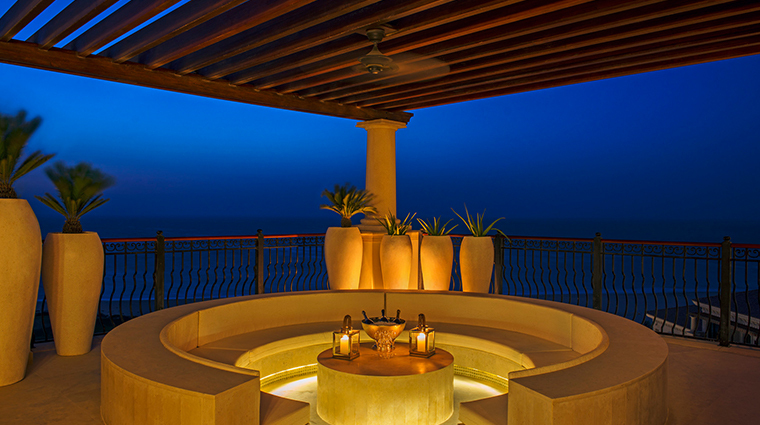 Opt for one of the locally inspired hammam experiences that leave your skin feeling cleansed and hydrated. 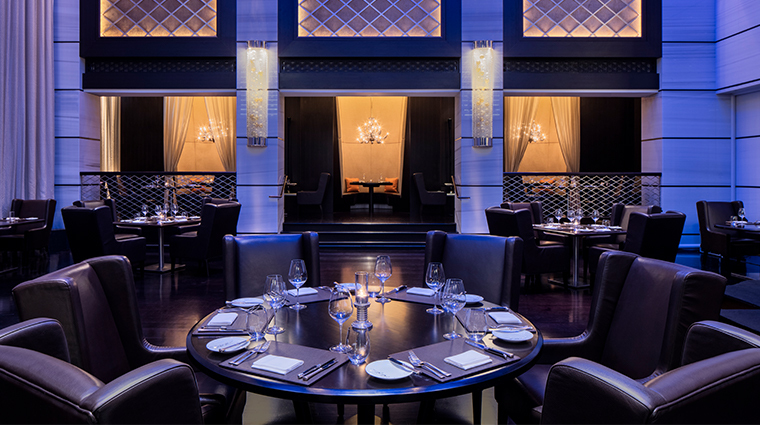 An epicurean feast can be sourced in 55&5th, The Grill with its vast steak selection and wine lounge with some 2,000 varietals. 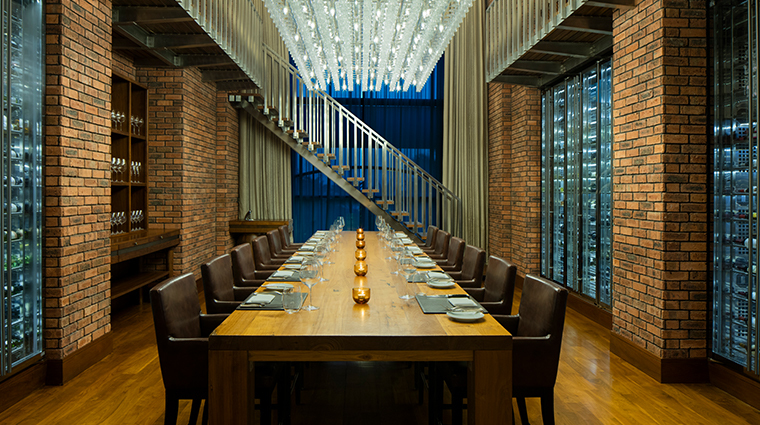 A private dining room provides the ideal spot for those who seek a more intimate meal. Five revitalizing pools offer a respite from the desert sun. Each one is a bit different, so tour them all before committing and dive into your preferred plunge. 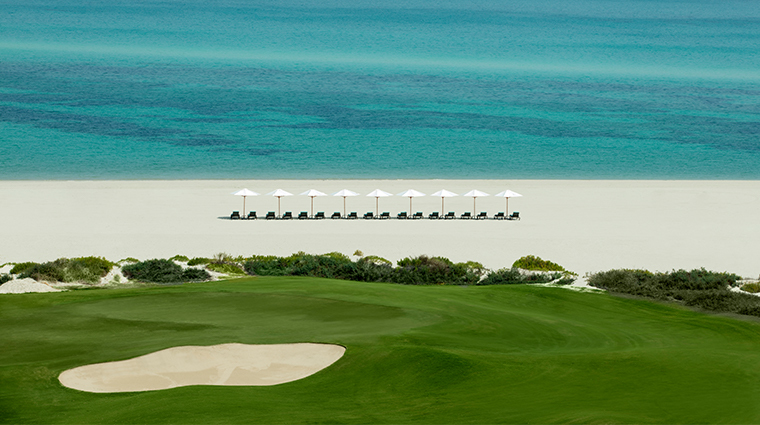 Surrounded by the prestigious Saadiyat Beach Golf Club, the resort’s stretch of sand is so sublime that endangered hawksbill turtles are known to nest in its dunes and bottlenose dolphins gambol in its surf. The 37,673-square-foot St. Regis Athletic Club is so well-equipped, you’ll have no excuse to not squeeze a workout in here. Personal trainers, a juice bar, an indoor pool and a selection of classes are available every day. Each of the 376 rooms in the luxury hotel offers a private terrace with panoramic views of the sparkling sea, golf course or lush gardens. There’s a Nespresso machine in every room, but why bother brewing when you have a butler on standby who can whip up a cup of coffee or tea to your exact specifications? 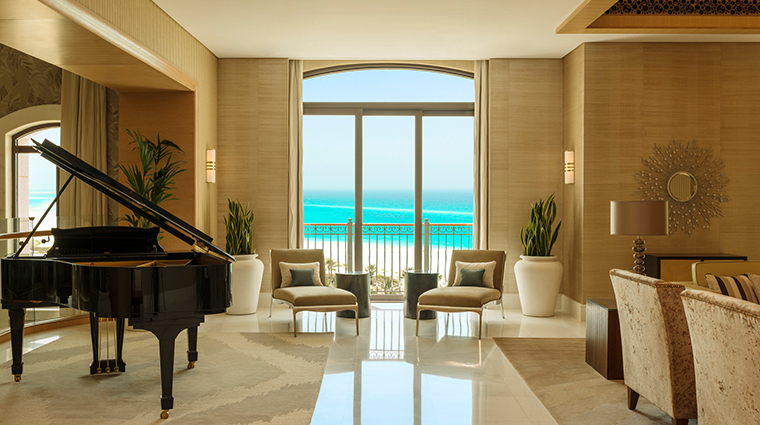 The St. Regis Saadiyat Island’s Royal Suite is one of the largest hotel suites in the UAE, clocking in at more than 22,500 square feet. 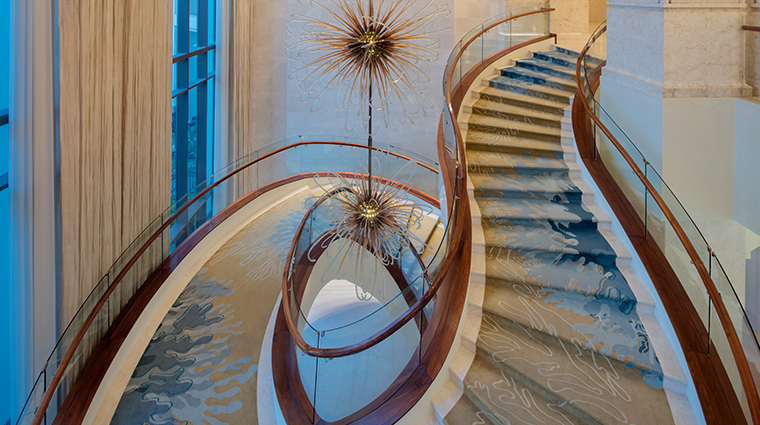 The opulent duplex occupies the top two floors of the resort’s west wing, and frequently hosts the who’s who of international luminaries. 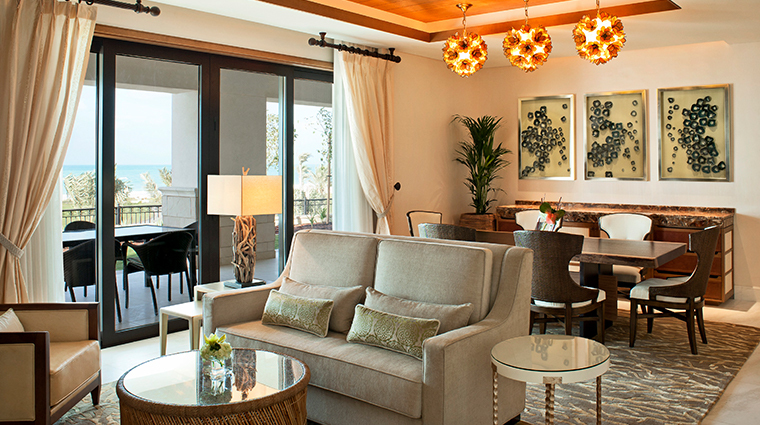 For a slightly cozier retreat, choose a Premium Sea View Room. These plush accommodations provide countless ways to relax with spacious rain showers and lovely water vistas from the freestanding bathtubs. A small wading pool, outfitted with a waterslide and plenty of gadgets, is just for kids — there’s no boring relaxation allowed in this water. 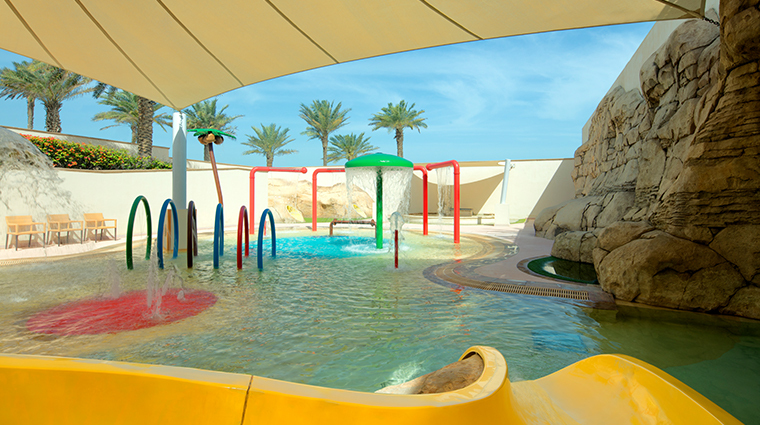 Suitable for children up to 12 years old, the resort’s Sandcastle Kid’s Club celebrates the art of play with plenty of space to stay active and an events calendar tailored to hotel’s younger set. 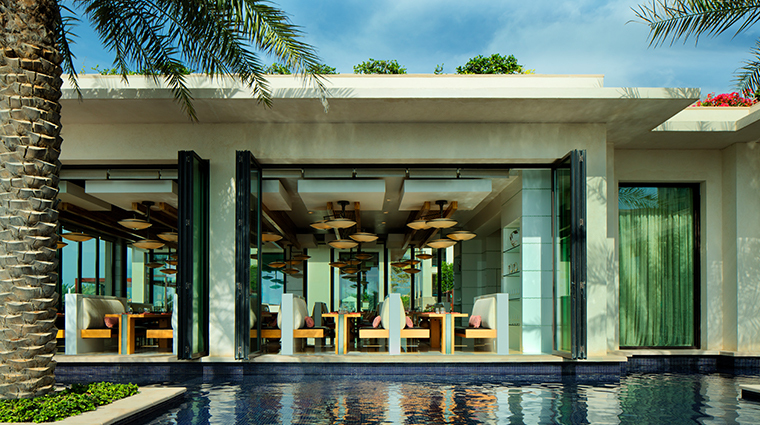 The hotels’ six restaurants all cater to tiny travelers with dedicated kids’ menus throughout. Picky eaters can stick to staples like grilled cheese and chicken fingers, while more adventurous tots can sample fare such as green bean salad with walnuts and feta cheese.